A brief history of Oh Henry! The Oh Henry! 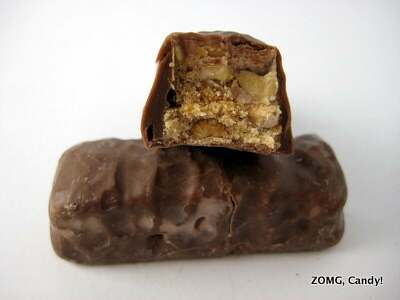 candy bar is an old school classic that’s been around since the 1920’s. In my experience, they’re pretty low profile – I see them in the candy aisle and in occasional fun size mixes, but I don’t think I’ve ever seen advertisements for them. Starting off though, Oh Henry was heavily advertised and its mysterious name got people interested. Named after a precocious and apparently very flirty child named Henry, “Oh Henry” was a common gripe among the girls at the candy factory. They eventually named the candy bar after him. A common misconception is that Oh Henry was named after baseball great Hank Aaron. That is actually not true! What’s in the candy bar? They were labeled as “peanutty, caramel, fudge bars in milk chocolate.” There were two bars in the package. The bars were solid, dense little logs. The fudge and caramel insides were chewy but not sticky and quite grainy. That combination of caramel-flavored fudge packed a powerful sugar rush wallop. Half peanuts dispersed throughout the bar added a light crunch to the texture and a strong nuttiness that did little to dispel the sweetness. The chocolate had a mild cocoa flavor that was totally overwhelmed by the fudge center. While the make-up of the bar sounded promising, it was entirely too sweet for my taste. A glass of milk helped with the cloying sweetness, so an O – but it just barely escaped getting a — rating. Japanese Kit Kat Review – Framboise Flavor! Japanese Kit Kat – Sweet Potato Flavor!